Is the Mayweather – Pacquiao fight any closer? By John F. McKenna (McJack): With the settling of the defamation lawsuit brought against unbeaten WBA light middleweight champion Floyd Mayweather Jr. (43-0, 26 KO’s) by Filipino icon Manny Pacquiao (54-4-2, 38 KO’s) it would seem that the pieces are finally falling into place for a mega fight between the two. The lawsuit was thought by many to be an obstacle which would prevent the two from ever fighting. 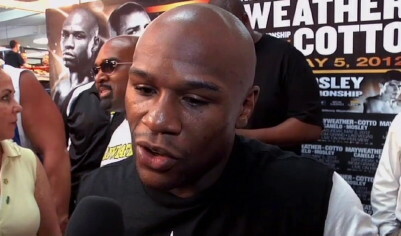 “Money May” himself had stated on a number of occasions that a fight was impossible as long as he had the Pacquiao lawsuit hanging over his head. But does the settling of the lawsuit really indicate that the long anticipated match between Mayweather and Pacquiao is really any closer? In the past Mayweather has used any number of what some would describe as excuses to avoid the “Pacman” in the ring. Various promoters have been attempting to nail down a deal for the past three years which would make the match possible. Initially team Mayweather insisted on Olympic style drug testing. At first Manny balked at the drug testing that Floyd insisted on. When Pacquiao realized that he was losing the public relations war in the press he finally agreed to Olympic style drug testing. For many months now drug testing has been a non issue, although “Money May” sometimes still raises the issue. After the drug testing issue was put to rest, revenue sharing became the major issue. It is thought by most boxing pundits that a Mayweather – Pacquiao fight would far eclipse any fight in boxing history in the amount of money it would bring in to the coffers. In terms of Pay Per View (PPV) sales it is though that the PPV sales alone would be in the $150 million range. No matter how you slice it, both fighters would fare exceedingly well financially. Several months ago Floyd contacted Pacquiao by telephone and offered him a flat $40 million to fight him. Mayweather would receive the lion’s share of the revenue. Pacquiao of course rejected the offer and stated later that Floyd was trying to make a fool out of him. Most boxing pundits did not see Mayweather’s offer as being legitimate with many seeing it as his way of saying he really did not want to fight Pacquiao. Floyd will more than likely retire after a couple of more fights with his “0” intact. To do that, he has to be more cautious than ever in selecting future opponents. Miguel Cotto (37-3, 30 KO’s) gave Mayweather a tougher than expected fight last May. Cotto, it must be remembered was dominated and stopped by Pacquiao in November 2009. And despite Floyd’s assertion that Miguel was weight drained when he fought Pacquiao he weighed just a pound less than he had in his previous fight. It is almost a certainty that Mayweather will avoid a dangerous fighter like Pacquiao at all cost. He can then spin it to make it appear as though it is Top Rank CEO Bob Arum’s fault that the super fight did not come off. After all, “Uncle Bob” is an easy target. Boxing » Floyd Mayweather Jr » Is the Mayweather – Pacquiao fight any closer?